A new report issued today by the Global Business Travel Association (GBTA) Foundation highlights the positive economic impact that road warriors have on the nation's economy and explores the quantitative impact business travel has on the U.S. economy. 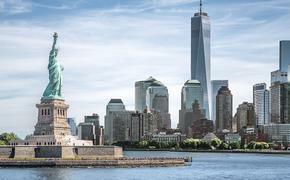 According to the study, business travel was responsible for about 3 percent of U.S. GDP in 2012 ($491 billion), and for every 1 percent increase in business travel spending, the U.S. economy gains an additional 71,000 jobs, nearly $5 billion in GDP, $3 billion in wages and $1.2 billion in tax collections. "Business travel is an important aspect of travel and tourism," said Rep. Gus Bilirakis (R-FL). "As the Global Business Travel Association's study notes, nearly $500 billion was contributed to the U.S. economy by business travel alone in 2012. That same year, Florida's tourism industry supported over one million employees and contributed over $51 billion to Florida's economy. "Business travel and the tourism industries are a crux of economic vitality across the country, and especially in states like Florida. The bottom line is that both international travel to the United States and domestic travel within our nation create jobs. As Co-Chair of the Congressional Travel and Tourism Caucus, I will continue to work to foster an economic climate that promotes travel and economic vitality." - In 2012, U.S. domestic business travelers spent an average of $540 per trip, including $147 on lodging,$230 on transportation, $100 on food and beverage, $28 on shopping and $22 on entertainment. These averages consider all trips – day and overnight – and all methods of transportation – air, rail, personal auto and rental car. Business trips that utilized air travel as the primary mode of transportation averaged $1,100 in total spending per trip. 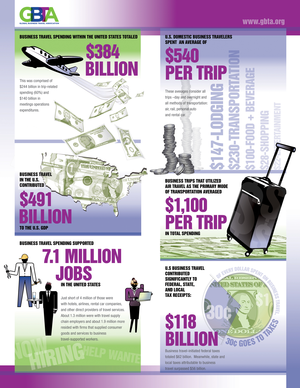 - Business travel in the U.S. contributed $491 billion to U.S. GDP in 2012. Essentially, every dollar of business travel spending generated about $1.28 in GDP. Of the $491 billion total, $208 billion accrued directly to businesses that served travelers or meeting attendees. The supply chain for these businesses received an additional indirect contribution of $120.5 billion. Finally, the downstream spending of business-travel supported wages generated an induced contribution of $162.8 billion. - The average business trip lasts 1.75 days and covers 268 miles (945 miles if primary transportation is by air). The typical U.S. business traveler takes about four daytrips and two overnight trips per month. Over the course of a year, a road warrior on average spends 19 nights in a hotel. - U.S. business travelers are most likely to be mid-career (age 35-55) and be employed in a managerial or professional position. Business travelers have an average annual household income of $102,329 and almost three-quarters of business travelers are married.